Chennai Metro Rail Ltd. (CMRL) has commissioned two rooftop solar power plants at the Naganallur and Meenambakkam stations on its metro line. 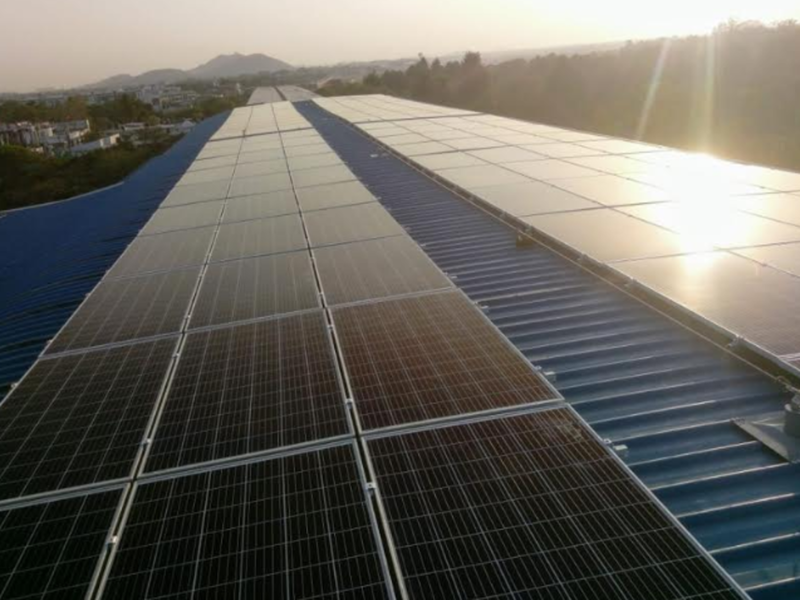 CHENNAI (Metro Rail News): Chennai Metro installed two new solar plants worth a combined capacity of 428 kW on the roofs of the two stations and the electricity generated will be used to meet the day-to-day power demands of the two stations. The new solar plants having a capacity to generate around 57,780 units per month, will save around Rs 26.34 lakh per year. the major portion of operations at the stations is planned to be powered by solar panels in the future, CMRL is also working towards using solar power for operation of trains eventually. CMRL has a total installed capacity of 4.1 MW solar power including those installed at its head office in Koyambedu and a few other metro stations. The generated solar power will be utilized for lighting systems and to operate electrical equipment required for the maintenance of the stations. Chennai Metro had already installed 1 MW solar panels at its depot and 125 kW at its car park area generating a total of 1.35 lakh units a month saving CMRL Rs 21.6 lakh for CMRL on power charges. Another 2.5 MW rooftop solar power installation is under progress and is expected to be completed by the end of this year. Recently, the second phase powering of Kochi Metro with solar power will soon be inaugurated with the installation of panels at Muttom yard. The latest capacity additions are expected to bump the metro rail corps solar power usage, almost doubling it to 40 percent.